A Network Video Recorder (NVR) is a video recorder that is connected to your computer network and records video footage from the IP cameras also connected to that network. It allows you to manage an IP camera system via existing computers and IT hardware. A NVR is different from a network-capable DVR in that a DVR is for use with analogue CCTV cameras that must be physically connected to the DVR itself, whilst a NVR is for use with IP cameras and records video from the cameras via the network without need of a direct connection between the IP cameras and recording device. We provide free technical helpdesk support if you require assistance with the installation, configuration or use of your purchased NVR. In addition, we also offer on-site installation, commissioning and training. Our technicians are specialists in IP CCTV and security systems. We would ensure your NVR and connected IP cameras are set up correctly and to your specific requirements, getting the best out of the system. To receive product promotions and updates, Sign up to our Newsletter now and stay informed on the latest in IP video & security. This compact network video recorder by Axis is ideal for small businesses that need straightforward video recording with easy access from mobile devices. With a simplified setup, wireless support, built-in Power-over-Ethernet (PoE) switch and a USB port for exporting video, it's a real "out of the box" video recording solution. 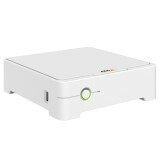 16-ch NVR with up to 12TB storage, integrated PoE switch, HDMI output and pre-installed XProtect Professional software. Affordable 8 channel 12TB NVR with integrated PoE switch & HDMI output. NVR with up to 16 channels, 12TB storage and PoE switch. 12-channel NVR with up to 20TB storage and pre-installed video management software.